​Wait. … W. A. I. T.
When you read that word, how does it make you feel? Can I just be honest and tell you I’m not overly fond of waiting? I don’t mind pulling up behind another car at a traffic light and waiting for the light to turn green. But when I pull up at a traffic light that is red and there is neither another car in front of me, nor traffic coming from the other direction and I have to wait, and wait, and wait, I can get a little antsy. Or when someone has agreed to have something done for me by a specific deadline and it isn’t, I can grow disinterested of waiting. 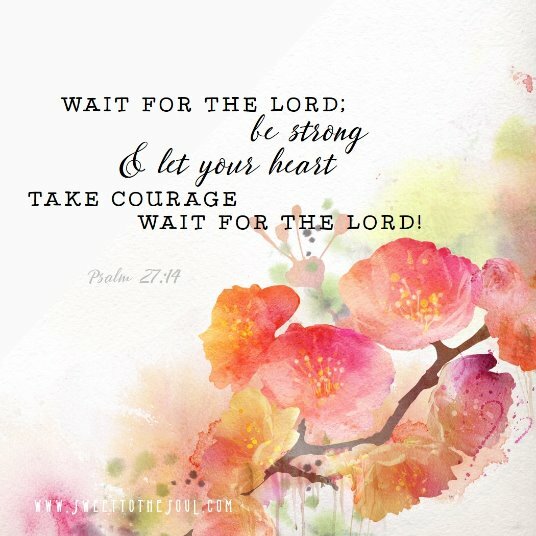 ​The hardest times for me to wait, however, are when I’m waiting on the Lord but I’m not exactly sure what I’m waiting for. When I’m just waiting for Him to move and show me what to do next, I struggle the most. ​Being in a season of wait, of not knowing and waiting to find out, takes courage. In Jeremiah 29:11 we are told that God knows the plans He has for us, and His plans are good. His plans for us are for a future and a hope. So in those times of wait, we must trust in His plans and trust that while we cannot see the map from our current point A to our eventual point B, God knows the route and the resources required to get there, and the path is a good one filled with hope. 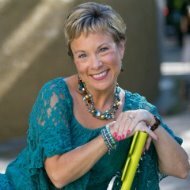 ​It can be tempting to grow frustrated or discouraged in the waiting seasons. I know many who begin to blame God and become angry with Him during their time of wait, as if our seasons of wait are some form of God-inflicted abuse. Yet His word tells us the truth about His character. ​“The Lord waits to be gracious to you, and therefore he exalts himself to show mercy to you. For the Lord is a God of justice; blessed are all those who wait for him” (Isaiah 30:18). God doesn’t inflict periods of wait on us to torture us. Sometimes waiting periods are necessary to work out other details for our good. Sometimes they are a result of our own sin. Regardless of the reason, we can be assured that it is God’s ultimate desire to be gracious to us and bless us. ​Invariably, it’s in the times of wait that I’ve grown the most. When things in life are moving along smoothly, as much as I hate to admit it, I can grow lazy or fall back on my independent nature. But when I’m in the wait, the frustration and desperation drive me to interact more diligently with God. I’ve wrestled with God in the wait. I’ve questioned and I’ve argued and I’ve cried in the wait. But it’s in the wait that I’ve often pursued Him most fervently, with my whole heart. His word promises that when I do that, I will be rewarded richly with finding Him. and “But if from there you seek the LORD your God, you will find him if you seek him with all your heart and with all your soul” (Deuteronomy 4:29). ​What are you waiting for? Will you use that time to draw closer to Him and let Him be gracious to you? YES, He always has the best for us if we will get out of His way and wait on Him. He is sovereign. He is faithful. He is good. Keep waiting on Him. #HopePrevails! I don't like to wait either, Michelle! No, no, no! (That's what I inwardly yell sometimes. :-) ) But it's definitely true that frustration in the waiting can lead us to seek God with more desperation and desire! Yes, let's draw closer to Him while we wait. That's where He shows His graciousness to us. And He IS so gracious to us, Betsy! I think we forget that sometimes He is keeping us safe in the waiting. I don't like the waiting, but I'll gladly take the increased intimacy with Him that my seeking Him produces! #HopePrevails! Oh I am NOT a patient person when it comes to waiting on others, even though I know too often people must wait on me. Several years ago God took me through a season of waiting - years - I have to admit it was a valuable lesson learned because God's timing is always perfect! He still has to remind me sometimes though! Thank you for this reminder today Michelle! Such a wonderful encouragement! Jana, I think the thing I have to go back to and remind myself of the most (because I have such a hard time waiting) is that God is never late. He's rarely early. But His timing is always perfect. I'm the one who gets in a hurry. And when I do, I very likely will miss out on the blessings that He is trying to orchestrate on my behalf. Blessings to you. I am waiting on the Lord at the moment, and yes, it has driven me to interact more diligently with God - these last three days particularly as I've been on my own. And it has been wonderful. Oh yes, waiting on God brings us to him. Glad you've had some beautiful fellowship time with Him. Rachel, diligent interaction with God will be rewarded. He rewards all who diligently seek Him! Blessings to you! Beautifully said. I'm also in a waiting period, and am using the time to wade into His word as deeply as I wade into the snow into this season. Cindi, I can think of no better time spent during the waiting season than to wade into His word. He will honor that! Because of Him, #HopePrevails! This is the word. That the Lord gave me for 2016. WAIT and TRUST. I'm not good at waiting, sometimes I get to the point where I just feel I have to do it NOW!! Lol. But I do know that waiting for HIM, it will be better in the end. Just TRUST HIM.